Are de novo banks on the rise? De novo activity ground to a halt after the recession, but there have been a few green shoots recently. We ask if this activity is significant, and what factors could help—or harm—their chances and those of other potential applicants. De novo bank formation since the recession has been almost nonexistent. This is a major change from the two decades preceding the recession, when FDIC data show there was an average of 172 de novo charters each year. Within the past year, however, there have been signs of life. The FDIC received six applications for deposit insurance last year (though one bank has since withdrawn its application). This comes after the FDIC took several steps to make new bank formation more appealing, including significantly trimming the number of years new banks are subject to stringent de novo capital requirements. While the FDIC has provided some relief to would-be startups, there are still significant challenges to starting a bank from scratch—and these hurdles are even more pronounced today given the prolonged low interest rate environment and challenging economic conditions for community banks in particular. While industry watchers believe de novo formation still has a place, they caution potential applicants to be realistic about their expectations today versus a decade ago. “At the time, the thinking was: Start a bank, add water and it will grow. But you need a lot more than water nowadays,” says Bruce Jensen, chief executive of Town & Country Bank in St. George, Utah, which opened in 2008 and now has about $135 million in assets. Despite the additional challenges of starting a new bank, some determined bankers have started down the de novo path—or plan to—knowing full well that it will be harder than it was a decade or so ago. These bankers contend that de novo formation is still a viable option in certain cases, especially in underbanked pockets of the country or in areas experiencing steady population growth. David Dotherow, who is working to open his third bank in Florida, says he expects to see several more applications in his state alone over the next 18 months. “I think there will be a lot of interest in the next few years, because there is a void of community banks,” he says. Winter Park National Bank, the first national bank application since 2009, sought approval to open late last year. In April, it received preapproval from the OCC and is putting operational plans into motion as it awaits the FDIC’s nod. Dotherow projects that the bank’s single branch will be open to the public by the end of August. He’s in the process of raising the necessary capital he needs to open: $30 million to $40 million. Since his bank’s application became public, Dotherow says he’s gotten several calls from bankers seeking his advice on starting a bank from scratch. He counsels them to make sure their reasons make sense and that it won’t be easy. Heightened capital requirements, for instance, can be a major sticking point. To illustrate how capital expectations have changed over the years, Lori A. Maley, president and chief executive of Bank of Bird-in-Hand, a $200 million-asset bank in Bird-in-Hand, Pa., says her bank raised $17 million of capital to open in 2013. Ten years earlier, when she helped open Berkshire Bank in Wyomissing, Pa., the bank started with only $8.3 million of capital. The situation today is complicated further by the fact that regulators expect you to have all the necessary capital upfront, explains Peter G. Weinstock, a partner at Dallas law firm Hunton & Williams LLP, who has significant experience advising de novo banks. It’s also harder to attract investors than it once was. In 2008, when Town & Country Bank opened, many banks were formed with shareholder expectations of a nice return in a relatively short period of time. Healthy banks were selling at 2.5 to three times tangible book value in some cases, says Jensen. “Now, a smaller community bank might sell between one and two times tangible book. The landscape has changed significantly,” he says. When Bank of Central Florida in Lakeland, Fla., opened in 2007, it raised $23.5 million in capital, which was a lot for a bank at the time, according to Paul Noris, president, chairman and chief executive of the $475 million-asset bank. If the situation then were what it is today, Noris says he’s not sure he would have tried to raise these funds based on the current financial situation for community banks. For starters, he says it would be a challenge because he’d have to tell potential investors they wouldn’t see returns on their investment for at least seven to 10 years, taking into account the heightened capital requirements and low interest rates. “That’s a long time to be patient,” he says. It’s a particularly hard sell because investors can potentially get better returns elsewhere—and more quickly, too. “It’s tough now as a community bank to make enough money to provide reasonable returns to our shareholders, which is why we exist,” Noris says. Bankers nowadays also have to spend more time upfront crafting the new bank’s business plan and determining its executive team, because material changes could significantly delay the approval process, according to Weinstock. Would-be de novo banks also have to be realistic about their timing. Realistically, it takes nine to 11 months from when you file your application to opening day; if it takes longer than that, it’s likely the application is troubled, according to Weinstock. Bankers with past experience also advise potential applicants to carefully consider the vast amount of legwork involved in creating a functional bank. 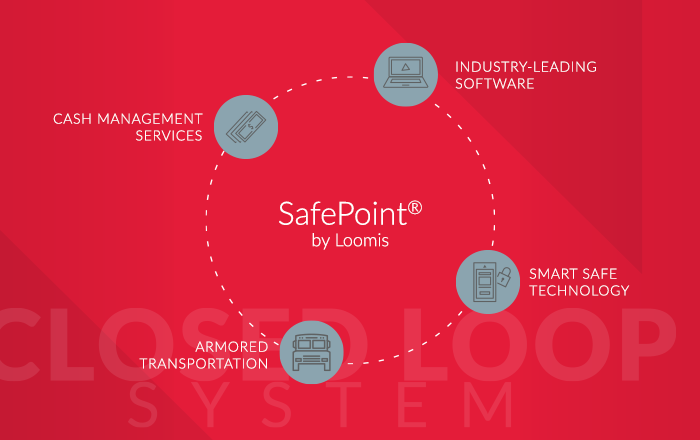 The behind-the-scenes work encompasses everything from picking a core processor to setting up operations and technology to compliance to picking third-party providers, buying office furniture and more. Every person you bring in at the beginning is a critical hire; everyone has to be hands-on and willing to take on multiple jobs, Maley contends. She was chief financial officer in Bank of Bird-in-Hand’s early days and used to joke with coworkers that everyone needed to take their vitamins so they didn’t get sick. “There’s so much you take for granted with an established bank,” she says. “If you don’t have that, the regulators are not going to approve you,” says Dotherow. Maley says the collective experience that she and other teammates brought to the table made the planning process much smoother, because they knew the nitty-gritty of setting up a bank and how to work productively with regulators. “It is critical to bring in people who know how to do this,” she says. In addition to having a competent team of workers, Dotherow advises de novo hopefuls to pick directors and investors who will not only provide the bank with capital to get started but who can also bring in future business. Although a startup bank is under the gun to raise capital before it can open, finding the right investors is time well spent. If you only get passive investors, it makes it harder to build the bank’s business in the future, he explains. Management also needs to be entrenched in the community and able to bring in future business. “You could have all the great operations people in the world, but if you don’t have any business for them to service, you won’t be profitable,” Dotherow says. There are a number of hurdles along the way that could derail the de novo process. You might not be able to raise all the required capital, management could pull out, market conditions could change or any number of other situations could throw a wrench into things. Already a few applicants have pulled out for one reason or another. Core Commercial Bank was approved in December 2015, but it won’t be opening, according to FDIC data. Ed Carpenter, who heads the private equity firm associated with Core Commercial, was unavailable for comment. Another would-be de novo, Pacific Metro, recently withdrew its application for confidential reasons. The chief executive associate with Pacific Metro declined to comment through a spokesperson. Certainly it helps to have a good relationship with regulators. But while regulators can be very helpful for bankers going through the de novo process, Weinstock also cautions bankers not to confuse them with consultants. Some banks think they can ask the regulators how much capital they need. Instead, you need to tell them how much capital you need to run your business plan, and they’ll audit you to make sure they agree, he says. 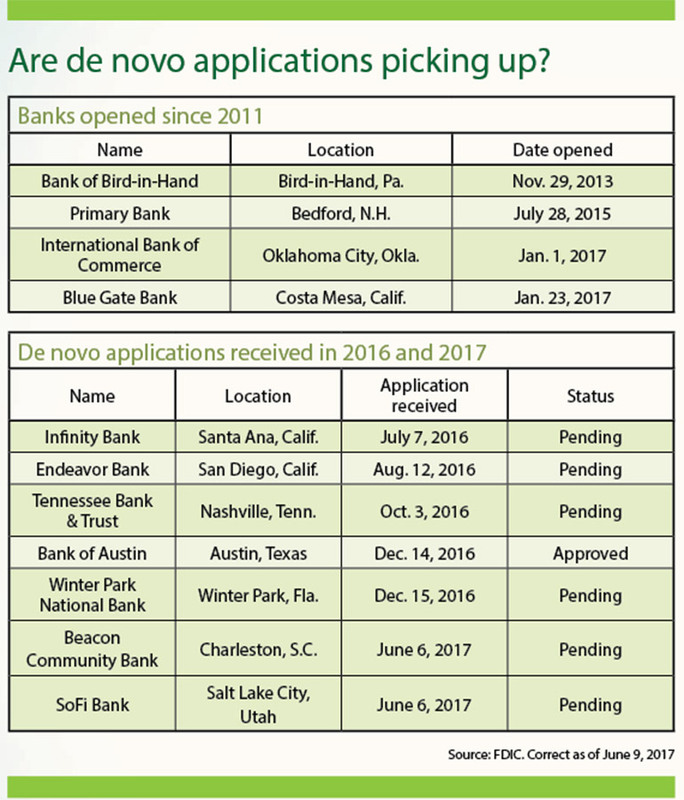 For its part, the FDIC has made a number of changes over the past several years designed to help spark de novo foundation. For example, it reduced the de novo period to three years from seven years and updated its guidance on regulatory expectations for new banks. The FDIC also hosted information sessions to help prospective institutions better understand how to apply for deposit insurance, and in April, the agency published the final version of its long-awaited handbook to help de novo banks apply for deposit insurance. Even so, the FDIC’s expectations for de novo banks are too onerous, according to Chris Cole, executive vice president and senior regulatory counsel at ICBA. He contends that more regulatory relief, as well a more favorable business environment, is necessary for de novo activity to return in a meaningful way in the United States. Indeed, though they are encouraged by the progress, several industry observers don’t expect to return to the heyday of new bank charters any time soon, given the new regulatory, economic and competitive realities. Cheryl Winokur Munk is a writer in New York.